Markus Schneider has a good sense for marketing. This young winemaker from the Pfalz developed a neat modern website for his estate, he designed a cool layout for all of his wine-labels, building an easy recognizable style and last but not least, his wines are poured at the posh restaurant Sansibar on the Northern Island Sylt, which gives an extra-kick to the brand name and helped building the aura of a top-newcomer estate. But this eye-candy marketing façade isn’t a bluff package because once you try the wines and get to know the estate you realize that there is lots of work, creativity and winemaking talent happening behind the scenes. Markus Schneider strived towards building his own cuvees and therefore splitted all his vineyards by terroir characteristics before reassembling them (for red cuvees) or simply bottling them as single terroir wines (especially the whites). This work results in a whole panoply of white and red wines which the estate has on offering, but after a tasting at the estate I must affirm that the ones which stood out for me were his reds which clearly belong to the top league of Germanys red wines. It is no secret anymore that the classic white wine region Pfalz can also bring up some fine reds. The Pfalz winemaker Knipser who was somehow the precursor for red wine cuvees in Germany, proved that Cabernet and Merlot can ripe well in these Northern regions. And I guess that Knipsers success somehow must have inspired Markus Schneider who produces several very good cuvees, mixing classic bordelaise varietals such as Cabernet Sauvignon, Cabernet Franc and Merlot with regional varietals such as St. Laurent and Portugieser. But the red wine which convinced me the most in the end wasn’t one of his cuvées but rather his single varietal Pinot Noir wine made of Pinot grapes harvested from 2 different terroirs. Today is the third time I tried this Pinot; I once tried the 2004 vintage which I bought in a wine store: for that vintage I had to leave the bottle open for a whole day before it became accessible, but after that day it tasted delicious. Then I tried the 2005 vintage at the estate itself and consequently bought a case of it, a bottle of which we opened today. What stroke me instantly with this 2005 vintage was that it barely needed decanting in comparison to the 2004. No harsh tannins, no astringency-just ready to drink Pinot pleasure. It is a nicely perfumed wine with a rather strong but not at all “woody” vanilla note coming from the barrels. The fruit was very puristic with black cherries both in the nose and on the palate. In the mouth the texture was remarkably silky and the wine appeared very dense with a great length. It is a very classy Pinot with a slight New World edge and I wonder how it would compare in an international tasting. For me it is worth a clear above 90 rating, somewhere between 90 and 92 points. Try it and tell me what you think. 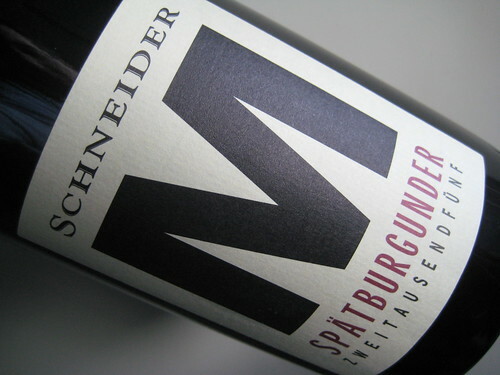 Update May 17th 2009: I opened 3 bottles of Schneider M the last week and 2 of them were corked, what a bummer! I wonder if there is some bad quality corked involved here !? Further, those 2 corked bottles could have easily been recongized as simply bad wine because the cork wasn’t that intense at first, only after 2 days int the re-closed bottle it was clearly evident. Well at least the third bottle showed how beautiful this wine can be, dense, silky, deep, long etc.. simply a great Pinot. Hope my other 4 or so bottles are ok..
Knipser’s Spätburgunder 2003 was, and is I hope, still excellent. I have been trying the reds of Baden over 2007 and recently some of the top Ahr Wines..
Looks like I will have to return to the Pfalz..sounds a good one. Hi Barry. Ahr and Baden are both Pinot-Noir land in Germany. You should definetely try the Schneider one and tell me how they compare. Have a happy new year 2008! I tasted the whole portfolio last september and your mentioned 05 Spätburgunder M was really great, despite the New World Style. But several weeks ago I was quite disappointed by the performance, maybe bad bottle. Here is a Podcast with the winemaker and some impressions of the tasting.